1. You don't need a management degree or professional experience to create your business plan on Upmetrics. Just sign up, answer a few basic questions about your business, submit and you're done. Also, who knows your business better than you? 2. It is user-friendly, customizable, and fast. 3. It's a cloud-based software that means whatever information you fill in the system is safe and will be kept 100% confidential. 4. You can find a customizable template for your specific industry. Just edit it as per your requirement and you're good to go. 5. It is easy to collaborate with team members in real time. We were able to make changes and discuss feedback, all in real time without having to switch to another chat window or application. Well, my first experience with Upmetrics has been quite seamless. I just followed the prompts on the application and kept doing what I was being asked to at each step. As for cons, the biggest con of using such apps is that you can't collaborate or share or edit your copy without an internet connection. But guess we all are pretty much used to this fact now. Apart from this, I think Upmetrics can come up with multiple options for templates for each type of business. Otherwise, it has become my go-to app for all of my business planning activities. Damn, though i did not find any cons in software for my business plan, i would love to give some feedback which can be useful for may be others. First, there should be more templates which anyone can use. also it would be good if you guys provide some feature where industry experts can give their advice and guidance on improving our business plan. Dashboard is missing, software needs more inbuilt templates, add some investors information module if possible. 1. 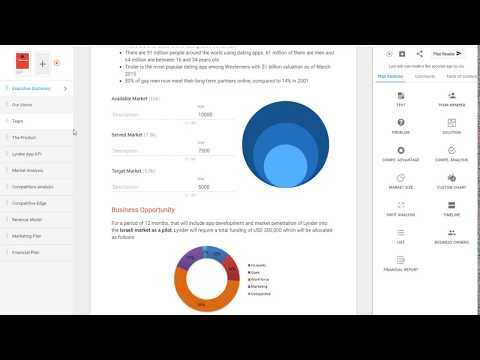 Real-time business plan editor with drag and drop plan sections. 2. Step by step guides with Industry standard tailored business plan templates. 3. Innovation with Business model canvases. 4. Unlimited team members, Easy collaboration. 5. Available as Online SaaS and desktop software installations. Below are some frequently asked questions for Upmetrics. Q. What type of pricing plans does Upmetrics offer? Q. Who are the typical users of Upmetrics? Q. What languages does Upmetrics support? Q. Does Upmetrics support mobile devices? Q. Does Upmetrics offer an API? No, Upmetrics does not have an API available. Q. What other apps does Upmetrics integrate with? Q. What level of support does Upmetrics offer?